FAYETTEVILLE, Ark. 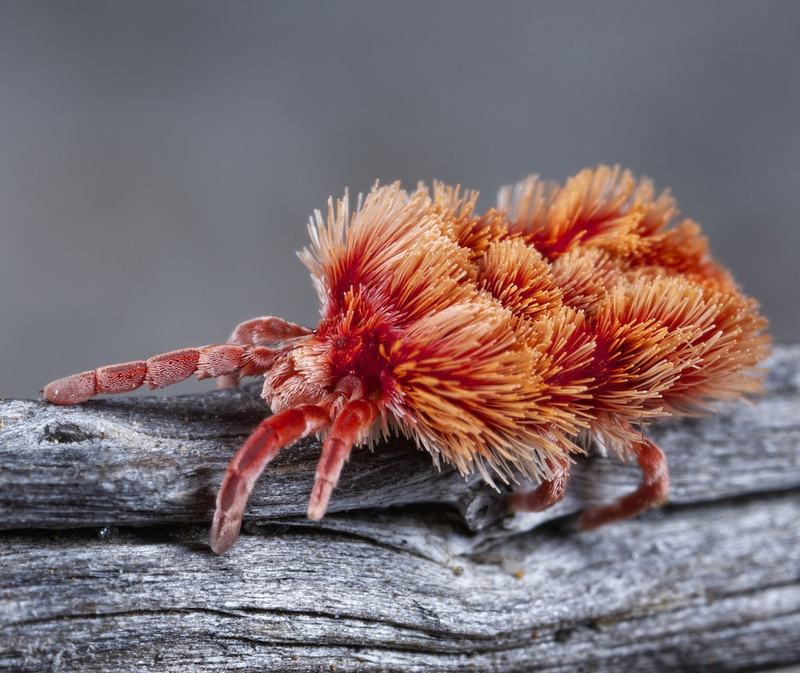 – Mites, the small creatures that are sometimes felt more than seen, are about to get a closer look so scientists can get a better idea of their role in the environment. A $775,765 grant from the National Science Foundation will support three years of research led by entomologists at the University of Arkansas System Division of Agriculture. In addition to supporting work by research scientists, the NSF grant also lists specific roles for amateur photographers and public school teachers in an effort to involve a broader segment of the public. Mesothrombium, a velvet mite. (Photo by Jurgen Otto)Credit mandatory. The study will cover water mites, velvet mites and chiggers, all of which make up Parasitengona, one of the most diverse groups of mites. They’ve been studied by scientists for centuries, but nobody has examined their roots extensively enough to build a detailed picture of their evolution. The Division of Agriculture team will do just that, led by Ashley Dowling, associate professor of entomology. “It isn’t a lack of basic information holding back Parasitengona research. It’s the absence of evolutionary context,” Dowling said. Investigations into their morphology – their form and structure – depend on the unknown evolutionary structure of a group that’s probably 300 million to 400 million years old. Water mites, velvet mites and chiggers have been treated historically as different groups. This project will attempt to pull them together to show how they evolved – “how chiggers became chiggers, how water mites became water mites,” he said. Currently, a research paper on water mites discusses their structure while a research paper on chiggers uses different terminology to discuss the same thing. “It seems like apples and oranges when it shouldn’t be,” he said. Dowling, whose team will include collaborators from Florida State University, said they will pick 600 to 800 species from the group of about 11,000 known species and collect enough data to begin understanding how they evolved. By using confocal laser scanning microscopy that produces a three-dimensional model of the insides of a specimen, the team can focus on hundreds of species and learn evolutionary information about issues such as how water mites were originally able to invade the water. The study is significant because it’s among only a few examining both the genetic and anatomical sides of an issue simultaneously. “We’re trying to do both, which should give us more of a complete picture and better understanding of how the group evolved as opposed to just looking at the molecules and genes,” Dowling said. A population beyond academia is being brought into the project through a citizen scientist program for photographers and by training public school teachers. In the past couple of years Dowling’s team has contacted photographers who have posted pictures of velvet mites and water mites online. The photographers often didn’t know what they had shot. The entomologists asked them to continue taking photos and also to start collecting the mites and tell about the habitat where they were found. Dowling said researchers often see amateur photographers online posting photos of velvet mites that they find and asking what they are. So his team began contacting people when they saw photos and asked the photographers if they collected that particular mite and asked if would they send it in or provide more information about the mite’s habitat. In the public schools, the research team will work with teachers to develop lesson plans in classes for different age groups and subjects that use mites as the model organisms. The teachers and their students will be on the lookout for mites in their environment. Dowling still has to work out details but he hopes to start with a couple of Fayetteville schools and then open the program to schools across Arkansas. “At that point schools or teachers can volunteer to participate or even get more involved to develop other lesson plans,” he said. “Students don’t understand that most life on the planet is very small,” Dowling said. “They get the impression that to find something interesting you need to go to the tropics.” One of the mites in this group is that little red thing that you see running all over sidewalks and on stone buildings. It’s a velvet mite and they’re running around on the sidewalks because they’ve evolved to eat pollen.